I would like to break down this treatment into two separate considerations: why hire a coach at all; and why hire Lee Povey. It’s been a very interesting 15 months now with Lee as my coach. A year ago I relished telling people that after 20 years of competitive cycling I had finally hired a coach. Everyone who knew me was impressed, for I had already coached myself to four California state mountain biking championships, two Race Across America records, two Race Across Oregon records and a human powered land speed world record. I certainly had every intention of continuing to coach and train myself for the racing and records I sought at that time. It was fortuitous, then, that I should meet Lee when I showed up at the track to lower the first of three world records I coveted. On that day I brought a slow bike, no skinsuit, loafers for shoes (practically) and, literally, at the very least, a sassy race helmet. Lee was finishing a session with some of his racers, noticed my warm-up, and queried my crew to find out what was going on. When he found out he volunteered some practical track knowledge that immediately paid dividends (I took more than a half second off my previous best 200 time trial mark!). I knew then that I would call him and talk about the prospect of being his only recumbent racing client. 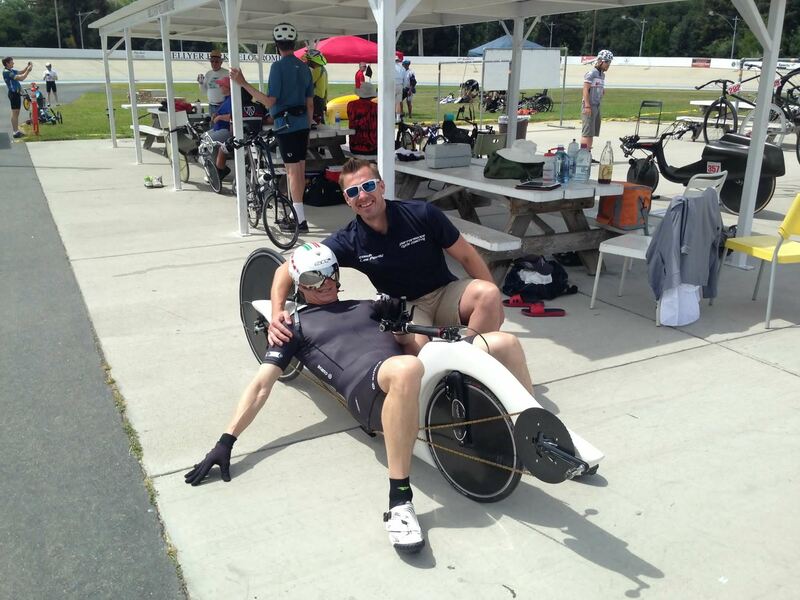 My main goal when I hired Lee was to set an age group world record for the hour time trial. My most recent racing had been ultra-marathon racing, and Lee had never trained anyone for the hour. It was quite a pairing. We fought some, but mostly I knew I needed to trust him. My work ethic didn’t need any help, and thank goodness for that – because everything else about my track racing did need help. What I found out along the way is that the beauty of good coaching is that it is synergistic: that the efforts of the client and the coach together produce a result that would have been unreachable separately. In a basic sense, one plus one equals more than two. The most impressive part to me is not that Lee knew something that I didn’t, and that he simply imparted that knowledge to me and that I therefore achieved greater than I would have. That is too elemental a view. What I realized was happening was that the idea that someone was in this with me pushed me forward; someone with more experience and more knowledge and more opinions and more ideas. And this merging of efforts to my undertaking enabled me to literally do more than I otherwise would have been able to do. I think there is something in the athlete’s mind that realizes how much quality coaching lends to their quest. Every hero we’ve ever had has trained with a coach – every top professional; every Olympian; every world champion. Because when an athlete and coach team up, one plus one comes out to be greater than two. When I saw it working, and I realized the synergy of the situation, the effect was then again magnified. To the point that now I am no longer striving for age group records, but also open records. Records that, in my mind, were previously unattainable – numbers and accomplishments that I had not even considered. Now, though, I absolutely believe I will lower those records. That is the value of good coaching. Synergy cannot happen without adding something – good coaching should absolutely be a part of your strategy for attaining your athletic goals. As for Lee, I must admit that I’ve never had another cycling coach. But I can say that at every turn I am impressed with his knowledge and experience. It seems to me that he knows when to talk with you, but also when to direct you. He is educated in the arenas that he coaches in, and he is confident in his ability. The ability to convey a viewpoint or a tactic or a strategy is paramount in coaching, and Lee has demonstrated that ability time and time again with me. Since realizing how important coaching is, I consider myself lucky to have run into Lee at the time I did. I do not doubt that as long as I strive competitively, I will retain Lee’s services. P.S. And, by the way, since meeting Lee I have set or lowered three world records. Some would think that information should be paramount, and offered at the beginning of this testimonial. I believe the relationship between coach and client is overwhelmingly more important than race results, and that the success of the relationship would be undervalued if only measured with race results. But I will admit I do like my records. I suppose my point is as much as I enjoy the destination, the journey is an integral and vastly more important part of the whole.